(New Britain, Conn., April 17, 2018) – The New Britain Bees today announced the signings of pitchers Andy Van Hekken, Elvin Ramirez and Jim Fuller, and catcher Nate Irving. Andy Van Hekken comes to New Britain for his 21st year of professional baseball and fourth in the Atlantic League. The former big leaguer has spent the past six seasons with the Nexen Heroes of the Korean Baseball Organization, including a brief stint the with the Seibu Lions of the Japan Pacific League in 2016. With Nexen, he made 156 total starts, posting a 73-42 record with a 3.56 ERA and 860 strikeouts over the course of 925.2 innings of work. Andy was originally drafted by the Seattle Mariners in the third round of the 1998 MLB amateur draft. He spent one year with the Mariners organization before being traded to the Detroit Tigers. After three successful campaigns with the Tigers, the lefthander made his Major League debut on September 3, 2002 with Detroit. He had one of the more memorable big league debuts, by throwing a complete game shutout against the Cleveland Indians, allowing only eight hits and two walks. Overall, he made five starts for the Tigers and collected a 3.00 ERA in 30.0 innings pitched. After a few more seasons in the minor leagues, he made his Atlantic League debut in 2006 with the Somerset Patriots and would pitch parts of three seasons in Somerset. In 520 career minor league games (449 starts), Andy has posted a 195-132 record with a 3.85 ERA and 2,152 strikeouts in 2,771.0 innings pitched. Elvin Ramirez joins the Bees during his 11th season of professional baseball and second in the Atlantic League after being acquired in a trade with the Long Island Ducks. The former Major Leaguer spent last year with the Bridgeport Bluefish, appearing in 31 games and posting a 5-2 record with a 2.31 ERA, two saves and 30 strikeouts in 33.1 innings pitched. The 30-year-old made his professional debut in 2007 after being signed by the New York Mets organization as an undrafted free agent. He worked his way up the farm system and made his MLB debut on June 3, 2012. He pitched 21.1 innings across 20 games with the Mets, striking out 22 batters along the way. In 264 career minor league games, Ramirez has earned 25 victories with a 4.04 ERA and struck out 421 batters across 501.2 innings of work. Jim Fuller joins the Bees for his 10th season of professional baseball and second in the Atlantic League, after being acquired in a trade with the Chicago Dogs of the American Association. Last year, the lefthander appeared in 18 games for the Long Island Ducks, collecting a 2.30 ERA with one win and 20 strikeouts in 15.2 innings of work. Fuller was originally drafted by the New York Mets out of Southern Connecticut State University in the 21st round of the 2008 MLB amateur draft. He spent five seasons in the Mets organization before joining the Minnesota Twins in 2014 and pitching in New Britain Stadium as a member of the New Britain Rock Cats. Jim appeared in 38 games for New Britain, posting a 3-1 record with a 2.41 ERA and 68 strikeouts over the course of 56.0 innings pitched. After this successful campaign, he spent the following two years with the Oakland Athletics and Pittsburgh Pirates, reaching the Triple-A level with both organizations. The 30-year-old holds a record of 30-22 with a 3.02 ERA and 445 strikeouts over the course of 426.0 innings pitched in 174 minor league appearances. Nate Irving joins New Britain for his first season in the Atlantic League and fifth of professional baseball. Last year the backstop appeared in 56 games for Sussex County of the Can-Am League, posting a .297 batting average with 15 extra-base hits, 25 RBI, 29 runs scored, and a .400 on-base percentage. The 25-year-old was drafted by the Arizona Diamondbacks in the 34th round of the 2014 MLB amateur draft out of the University of Virginia. He spent two years in the Diamondbacks organization before joining Sussex County in 2016 for his independent ball debut. In 133 career minor league games, Ivring owns a .249 batting average with 26 extra base hits, 51 RBI, 52 runs scored, and a .351 on-base percentage. 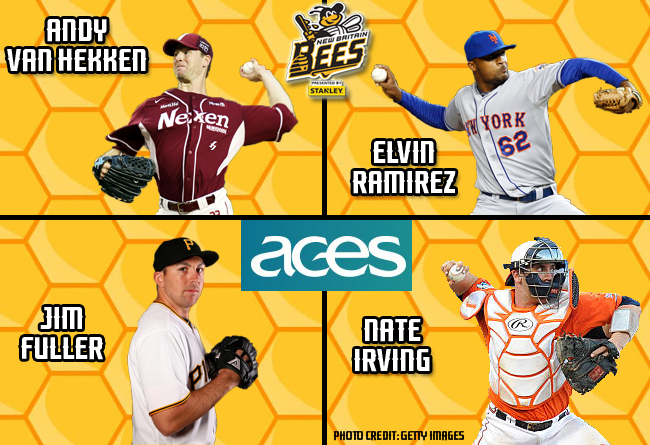 All New Britain Bees transactions are presented by ACES. ACES is dedicated to enhancing and transforming lives through education, innovations, and leadership. Visit https://www.aces.org for more information.